Kids in Voorhees might be used to going to the library to work on computers, but later this month, kids can go to the library and learn how computers work. Kids will get a chance to learn basic computer programing by using Scratch, a free visual computer programming language developed by MIT that teaches students how to program animations, games and more. Haddon Township branch librarian Martha Cannon, who has a master’s degree in computer science, just got through teaching a similar camp at the system’s Haddon township branch. 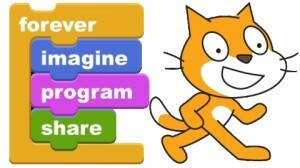 Cannon said scientists and educators at MIT designed Scratch to be intuitive and easy to use for all kids, as it doesn’t involve the detailed lines of code and syntax needed for more advanced programming languages. Instead, Cannon said the program is visually based, so children move around multi-colored blocks that perform the basic functions and commands of computer programing, and by assembling those blocks in different ways, they’re able to build their own programs. Cannon said kids can also share the programs they create with their peers, and they work collaboratively to comment on, and learn from, what others have done. “It focuses on programming interactive stories and games, so it’s something children want to do, and they can see what’s happening quickly, which always helps when learning something new,” Cannon said. Cannon said a goal of the library has always been easy accesses to information, and she feels more people in society should learn how the technology they use every day such as computers and cell phones actually work. Noting the gender gap that exists within science, technology, engineering and math fields, Cannon specifically invites girls as well as boys to the camp, so everyone can experience fun programming lessons free of intimidation. “This is for kids in the 21st century. This is for any child to learn how to think actively, collaborate and learn how to solve problems,” Cannon said. Camden County Library System public relations officer Mark Amorosi echoed those sentiments, and said the library system is always working to find something new for its patrons. “We think it’s a valuable program, and for the world kids are moving into and growing up, in it’s preparing them for the future,” he said. The weeklong camp will run for two hours every day, from 10:30 a.m. to 12:30 p.m., from July 25 to July 29. Those who wish to register must be available to attend every session of that week, as each day’s lessons will involve lessons learned prior. For those who can’t make the weeklong camp but still want to learn more about Scratch, the Voorhees Branch Library will also be holding single Scratch programming sessions on July 19 and Aug. 30 from 11 a.m. to noon. Registration for the camp or the single sessions is available by calling the Voorhees branch at (856) 772–1636 or signing up online at www.camdencountylibrary. org/events.